PIE also fund raises throughout the year by selling RADA knives. 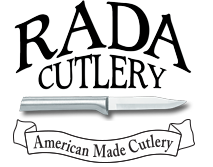 RADA Cutlery is 100% American Made raw materials and construction. Rada Mfg. Co. has made and sold over 142,000,000 knives since 1948, earning the reputation for remarkable cutlery, service, and value. RADA knives are guaranteed for life. You can find our display at The Craft Nook, 1007 W. Lexington Avenue in Winchester. Not only do they kindly provide us space, but they also include us in their Annual Country Christmas Open House.